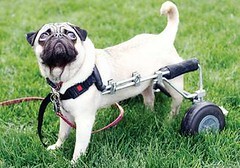 Dudley, a seven-month-old pug, was born with a spinal disfigurement called Kyphosis which made his spine compressed. This left his back legs paralyzed and Dudley would be forced to live in a wheelchair. Then came the Smith sisters who are known for taking in injured or unwanted pets. The sisters brought Dudley home and helped him get used to living in a wheelchair. Something changed when the sisters saw Dudley kneeling on his hind legs supporting himself. The sisters wondered if Dudley could regain movement in his legs and if physiotherapy could work for dogs. They consulted with a vet who focused on animal rehabilitation and the vet decided to give Dudley a chance and would do all of the physiotherapy for free. Dudley did physiotherapy for three months which helped him regain more movement in his legs. Last week, Dudley underwent surgery to realign his knee caps. The surgery went well and Dudley is going though physiotherapy again to help the recovery process. The vet has said that Dudley has already regained movement in his legs and feet. Miracles do happen. This entry was posted on Thursday, May 31st, 2007 at 3:51 am	and is filed under Dogs, National Dog, Cat & Pet Info, News for Cats, Dogs & Owners. You can follow any responses to this entry through the RSS 2.0 feed. Both comments and pings are currently closed.